We are living in a digital world. Your clients communicate digitally, work digitally, shop digitally. It is time for a holistic change. We can help you set your company up for the future. Our name is a promise we take very seriously. 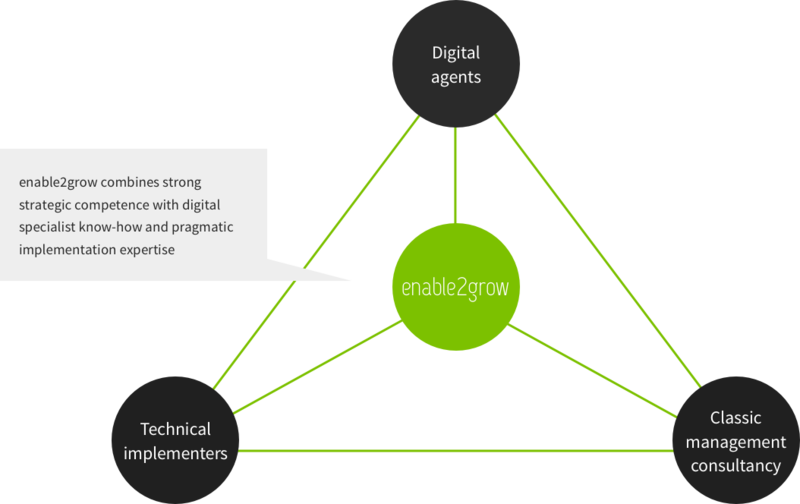 „enable2grow“ means: we are not capacity driven, but rather we bring together a diverse team from our network of experts dedicated to approaching your challenges in a holistic manner. Applying our proven 360° methodology to digital growth, we work with your employees to identify concrete growth opportunities and to develop a tailored approach to exploit this potential systematically. In order to grow successfully, your business should be aligned with innovative scenarios and challenging market developments – this allows us to recognize potential and exploit it at the right time. Accessing a new market is a challenge which is often underestimated – successful expansion can be achieved through systematic analysis of local conditions, realistic expectations and an agile approach. Being a frontrunner involves repeatedly rethinking your positioning, aligning with client needs and keeping an eye on the competition or new players entering the market. How much does a company need to invest in digitalization if it is to remain competitive? We will share our wealth (digital) experience with you in ordert o answer this core question for your organization. Innovation is a central driver of growth. As easy as it is for new start-ups to create new things, it is just as difficult for established companies to remain innovative. We will show you how to do it. Once you have succeeded in developing new strategies, you have to implement them. The central success factor for this is to enable your personnel – our favorite discipline. At the end of the day all your efforts in creating and implementing new strategies there to achieve competitive advantage and with it sustainable – and measurable – success. Enablement means, making it possible for your people to create and implement for themselves. This can succeed if they are supported by competent sparring partners with operational experience. Are you looking for a growth strategy?